The detailled past 30 days SP-2 rebuilt Report,soon with Pics ! Day 1: Well,i've got a lot of comments in Mind at present,regarding what has changed,the weights and the small mods which make a Bike different (vs. the former one).What i remarked except the changes all will know ,like throttledia, 12 hole injectors,Frame,Swingarm,Rim-design: looks like(as you exprsss it in Germany) there's no stone on the other,i've balanced some bits,had a view on headers conduction,hey -Honda made some great Steps regarding this detail.Don't think i want to say i'm better than this Company,it's only : i never understood how gas can flow this way Honda made the SP-1 headers.Cans are more than 2lbs less each,the whole wiring looks more simple,the Rads have each a small Fan.Removed all quitening gears-a funny Job. 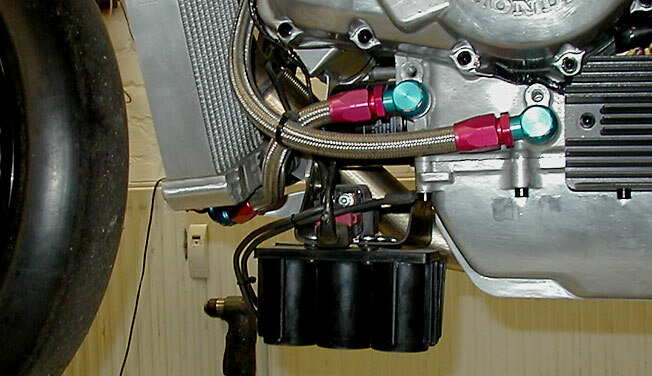 Day 2:Honda used 2 main-Grounds for their wire-harness,that's probably a part of the reason,why it's more simple all in all,but they've added a Fan-relais,so the Fan is now directed by the ECU. The SP-2 rectifier is MUCH larger than the former one,so first second i've had some doubts to locate it smooth,but found a good spot to locate it (think smart).However,stay tuned-the Pics are already inside Camera and will soon appear here. Day3: the Electronics re-locating bracketry takes as long as to tear up the whole Bike,a monster-work everytime torturing the brain where to put this or that,and now when it's the 5th RC51 wire i've got new ideas i havn't had before-the next evolution is always the smarter Evolution.For a track wire you need at least 2 Relais and 2 fuses,i made 2 seperate + , to safe the speedo+ and fuelpump+ ,and on the other side the ECU ,converter and display +.Wednesday i get the grinded primary and clutch gear,grinded down to 12.5 mm (from stock 17),then the heads should be already done regarding porting-Job,and i can start to assemble the Motor. Day 5:even it was holy Sunday i worked a bit at the 2,rest of the wire,grinded down the valve Cover emission Control cases,,made a big 26mm breather(-chamber) hole,cutted front valve Cover breather chamber down 2cm and closed it with an alloy-plate and glued it with special resin (to get space for upper rad),closed Waterpump-Bypass went home a bit earlier than usual but with a smile,the whole wire works,after F1 signal -reset no flashing light! 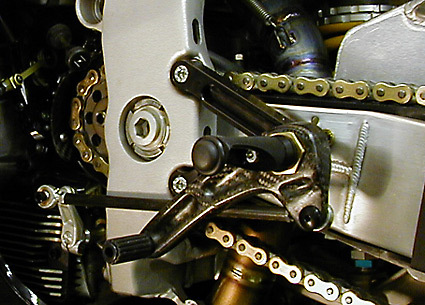 Day 6: had sth different to do,but however,got a lot of stuff today: PVM Perimeter Calips, Perimeter-brackets to suit to Öhlins Fork,then the Öhlins Fork itself,rear PVM wave-disc,PVM Radial Master Cylinder,rear little calip-bracket,today i put in in as far as possible,the i've to measure out some cleaerances to decide for which disc dia a disc-offset i go.Sth. different-looks like the shock linkage+ lenght is the same,so a Sp-2 shock will probably work in a 1 and vice versa,so i'll test my Öhlins in the 2 to verify i can use my Öhlins - Setup. Day7: coated (closed) the wire harness,mounted the Öhlins-Fork,Perimeter-calips + brackets,Radial-master Cylinder,and indeed very light and also adjustable handlebars,smart made-you don't need to remove upper triple clamp for removing the handlebars,began to mod my Airbox-the SP 2 is not is identical SP1 (RC51) regarding Frame-shape at the intake,there are l/r massive reinforcements,so the Airbox has to be rebuilt to fit.Expect the Titan for the Exhaust tomorrow-i like this Job,as long as i don't make more than 4 a year.Ho-a comment regarding weights (that nearly destroyed my day):The Öhlins is at the same weight as std. (3.9kg a tube each),and although the Perimeter-calips are nearly weight half of std.,you cannot collect the saving because you need a massive made bracket therefore-but it looks awesome.However,this Bike should be the lowest weight SP-2 worldwide . Day8:have almost finished the porting-Job,the Intake and Outlet is very raw done by Honda,also remarked today:the Outlet of heads doesn't fit 100% to headers inlet-shape,so- because the oval/square Outlet of the heads don't lead very good into headers you've to mod the heads outlet and also the headers at that spot,additional you can move the headers somewhat 1.5mm in the seat of head,so what i've done:made l/r welding spots at the header and milled the head equivalent position to fit only in one position-guess tomorrow i'll be able tb assemble the Engine and start with the Exhaust . Day9:made the rest of the Porting Job and re-assembled the heads and put them on the Engine-checked the Cam-drive gear backlash,that'll be a funny sound when first the Motor is running. I don't know yet if use the first 10 cm of headers,(where they're bolt on head),because it's impossible to fab i a reasonable Time this Item.The Problem is IN the turn of headers,where they leave head the shape starts oval and leads after 10cm in a round shape.Honda solved this problem with 2 pressed and welded sheet-metals.It is possible to handcraft it from Ti,but these f + r first 10cm headers will take a day,and i have to find someone to mill the gaskets from Ti.Sth. different 1: it's getting really cramped,the Frame reinforcements swallow space,the front ignition Coil is behind left side engine-bracket (jib),and right between these spots the main-hose is running,but that's not the main-point,it's,the Airbox doesn't fit by these measurements-so i started to reshape both Airboxes,created new space for Frame-reinforcements and main-hose. Sth different 2:made the drafts past few days for my own rearsets,i know it's a lot of stuff on Market,but i don't like these filigrane milled brackets and levers,that bend when you put your foot on.I always go for a H-shape milled bracket,looking real massive,but they're milled dowhn to 3.5- 4mm thickness.They built towers out of H-Shape metal,why no brackets.Nevertheless,i've also designed and already pressed Carbon Shift-and Brakelever therefore,hope it works. Day 10 is dedicated the 2 Airboxes re-shape,that's a work which normally takes all in all-until you've got the mould - a week each,but i've to cramp the Time Frame.The re-shape is done i'd say 80 %,i've remarked the injection-manifold is about 5 mm larger,so i've to re-shape the Airbox to find Space for the rear injector-also the front inside sheet metal that keeps the Airduct-rubber has,a main middle lower spot to be fixed (instead of 2 At SP1),so a re-shape there also. Day 11.you've to be careful drilling holes for windshield a spots to fix all and hold all together,careful with decision of final cuttings you need for rads,Oilcooler etc.,some may know it,it takes a while until all suits without stress.Fixed the Instrument on the Carbon-snorkel,cramped Matter here also,2 mm clearance everywhere. There are maybe 6 different cuttings for the fairing -depending if you've got a radial Master,if you've got a Carbon-Snorkel,or both together-then next Time a different cutting.Rads....and so on.Ok,you may say i can make one to fit for all,but that's not my way. Day14:got the Titan for the Exhaust!Worked until Midnight and now i'm already at height of Swingarm (2 in1 in 2 Section is 80% finished ,today (Day 15) i'll hopefully finish the remaining Part ,supercramped matter if you've got your own ideas to duct it,but i always work for 1-2 mm clearance to get smooth turns,and i've no problem with removing somewhere 1-5 mm Material that is in the way,if it's of no concern being there or not. Day15: it's 1am and done so far,the headers are spot welded.So far so good i can weld,and not bad,but you cannot weld Ti if you're not supplied with tons of Argon,so i'll carry all to the Aircrafts Industry,that's their Job there,welding Titan day in day out. 2042 gr total unwelded without springs for header-stuff cpl.thats 4.5 lbs. Calculate a max. of 2.8 kg for the Cans + Springs and we're at 4.8 kg Total (10.59 lbs),that's 4kg less than available Sp1 Acra or 10 kg less vs. Sp1 orig. or 8 kg less vs.Sp2 orig. Day 16.i'm doing my Job sometimes as good and efficient as a bomb,so after this header drudgery it took half a day to discover all tools again and to clean the workshop,nevertheless,modified upper rad in /outlet (gave different angle,see above), the 2 Airboxes for SP2 are under release wax and mould borders are done,tomorrow i begin with the mould. Day 18:got the PCIIIr,again looking around where to locate,how to fix it,made brackets,shortened the wires,made special lower brackets for the fairing to get sure the fairing don't contacts the header (hey 8 mm clearance! ).Began with moulds to copy some Brackets for Oilcooler and Rads in Carbon. Day20:don't wan't to tell much,because i don't want to be annoyed again,however,i'm more phoning where or how far the Bits are ,than working,cannot do this because that is missing and reverse,welder told me he'll go in holiday with his Children for a week so i picked up the spot-welded headers again and mounted them again,because i need the Information to mount all the coolers correct.Imagine: he could have had the chance to weld me an SP-2 Exhaust System,and what is he doing,in holiday with the Kids! Very strange.Ho-forgot,the miller should start these days with the brackets for rearsets,guess what he's doing,no not holiday-he decided to be ill ! Day 20-23:what i feared all the time,things come to standstill when when you cannot proceed because Bit's are missing,and all the guys you work together with are ill ,in holiday or have delay with the Bits they've to deliver .Also,no big deal,but i still havn't found a correct nice shaped Carbon front fender,it'a a Q if you want to mount not just anything. The discs i want for front are newest Generation of PVM and at present for test in Spain,but i should get them end of next week,together with special forged wheels from Alu-i gave PVM the objective not be heavier than 1 pound rear and 1/2 pound front than Magnesium,then they'll be better as Magnesium Cast,because on max. Diameter they're lighter (because milled),a milled from forged Magnesium upper clamp i wait also for,also a new light rearbrake assy,but manufacturers at present still havn't the drafts(SP1 and SP2 are different).The more i think about the offset,the more i think a steering-damper is necessary,at Sp-1 you didn't need this Item at all.Ta-and the shock:Öhlins passed the tests,and promised delivery end of February,we've March now and no Shocks available.Apart from that i never use a Öhlins shock as it comes out of the crate,even for std.heavy RC51 i.E. Öhlins used too strong,so wrong spring-rate(my estimation),with my lightweight SP1 i'm down from std.85 Nm to 66Nm/cm Spring. 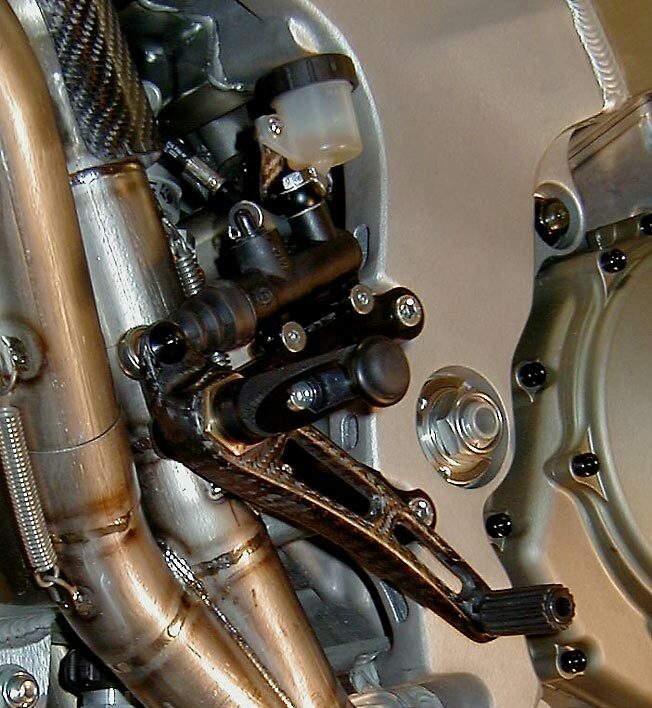 But the Öhlins Fork:i never would have assumed it's SO good,my 1st SP1 std. rebuilt fork is still far away from the sensibility of this Fork- a real recommendation .Next,i've decided especially for HRC fairing:to make a new 2" lowered battery Bracket,that should fit-and it's a great step conc. a location of 4-5 lbs. mass. Day 24/25: the SP-2 Airbox-moulds are done,maybe sunday first Glass Airbox will be fab'd,then a last check if the sealing works with std.Fueltank and the also the 2nd Fueltank-dummy Airbox.I really racked my brain about how to fix lower Rad and Oilcooler at bottom,so i decided to make the Battery-bracket from 10 plys Carbon-thats 2mm. That should last to fix some brackets .Als i've made an especially SP2 CPU -protector that's fixed at the left side arm,where the Engine is fixed,not too massive -not to destroy the Frame,but enough for a first impact (if happens there) to protect CPU. For Oilcooler i've made M14 x 1.5 thread into Engine . Measured out stretch of steering and looks like i can get away with an 90mm Öhlins steering damper,so i've ordered a sample,we'll see.Measured out the long srews that fix the engine to make some drafts-want to fab a smart nice light Alloy/Titan Solution (Ta !) for simple exchange. Day 26/27:Öhlins said SP-2 shocks this month probably not available. Ok,measured linkage distances of all bones and they're similar,so i've mounted the special Öhlins -shock i've calculated for my 2nd Sp1,with modified hydraulic setting and 72 Nm Spring,and indeed works fine.As i've heard and don't know it's true-Marvic or Marchesini has more than big Problems to deliver wheels,so PVM is drowning in orders at present-however they promised me the forged milled Rims this week.Hope i get my welder on the phone tomorrow to weld my Ti-System soon.My first Fueltank Dummy SP-2 Airbox looks good-sealing good,maybe tomorrow i'll make 1st Carbon-SP2 Airbox,also tomorrow i hope to get upper Carbon Oilcooler and Rad Brackets out of the mould to finish the whole Cooler-bracketry. Day 28/29:drove from A to B and C and reverse,re-welding this,picking up that.It's horror,only by the larger lower jib that holds the Engine you cannot use the angles the rads gaskets have at in-and outlet,so also the Oillines duct is different,but looks like the Coolers bracketry is 95 % done,2mm clearance everywhere,got the downgrinded clutch gear today so closed the Engine is finally.